It's the common complaint of parents and grandparents everywhere: kids just grow up too darn fast. It's more obvious when they are babies and growing out of their clothes faster than you can wash them and put them away. These days my kids aren't sprouting up quite as fast (though I may have to take that back about Nathan, he's grown half an inch in two months), but they are growing up in more subtle ways. With Nathan, I noticed something new that made my heart squeeze. A little while ago I took the boys to Disneyland on a school night (gasp!). We were all feeling a ton of stress, and when we got there, four of the five rides we specifically wanted to ride were closed or broke down right as we got in line. So, we went to the Castle and watched all the fluffy baby ducks and their mamas waddling around. We stayed there a really long time, close to an hour. All three of us were lost in our own little worlds! Finally we decided to go over to the other park, Disney California Adventure to ride California Screamin', which has a loop in it. The boys declared that we would ride it until someone threw up. No one threw up, but there was hardly a line and after four times in rapid succession, the boys were asking if they couldn't go on the nearby children's merry go round! While we were waiting in line over and over again, I noticed a group of three young girls who kept getting in line just in front of us or just behind us. They were giggling like maniacs, doing silly little things to show off, and sneaking glances at Nathan. Through listening to their conversation, I learned that they were currently in the 6th grade﻿﻿ and they thought my son, who towered over them, was cute. Gulp. My fourth grade son. My ten year old. Girls in the 6th grade were making googly eyes at my baby. I admit that when the boys said they wanted to go on the slower, gentler, merry go round, I was quite happy to let them. I wanted to get off the roller coaster, and I don't mean California Screamin'. I'm not ready for girls to be interested in my son. Or for that matter, for my son to be interested in girls. The first week of school this year Nathan admitted that he may have been wrong in thinking that all girls were gross and to be avoided at all costs. He's had a small but consistent crush on a girl that doesn't give him the time of day, which is fine with me. I don't think Nathan noticed the girls in line as he was deep in conversation with his brother about the current object of his desire: the Wii Lego Pirates of the Caribbean game. Please, my darling little boy, stay more interested in video games than girls for a few more years! Whoa. Now that's a sentence I never thought I'd utter, let alone put down in writing! Normally I'm trying to get him interested in anything but video games! And then there is Benjamin. Benjamin who is the light of my life and the dearest of dear children. He's so sincere all the time that I don't have to wonder at all what he'll be like as an adult or an old man. What he'll be like in his teens is the wild card, but I have to say that he's so consistent with such a strong sense of right and wrong and justice, that I doubt (and hope and pray) that he'll ever get into much serious trouble. He doesn't have to experience something wrong to know it's wrong. With Nathan, you can tell him something is wrong and should be avoided and he'll do it anyway, every single time, because he wants to see for himself why it's wrong or if he'll really get in trouble for doing it. Ben learns from other's mistakes so he doesn't have to make them himself. Not that he's perfect! He still makes plenty of mistakes! But he just so different from Nathan. Benjamin tried to shave. He got one of my shavers and went to town on his upper lip while he was in the shower. 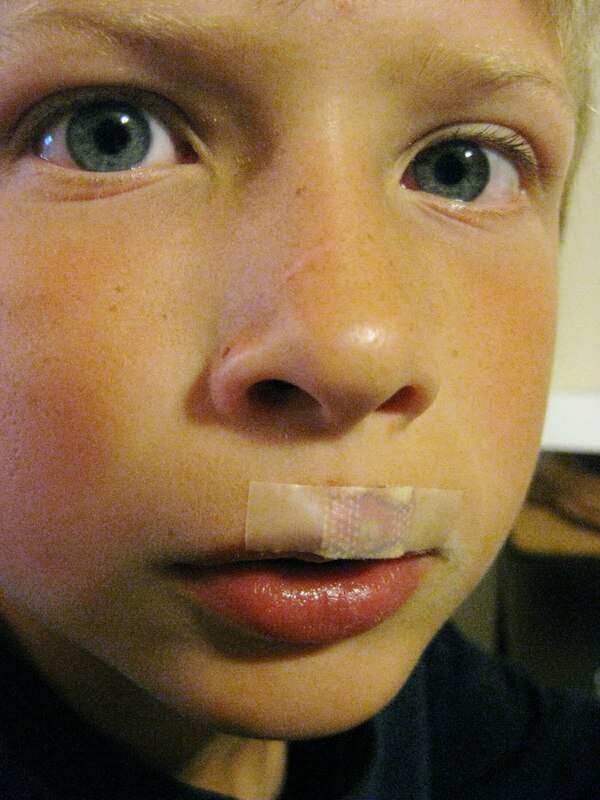 In the process, he actually removed a chunk of his lip. He waited several minutes, trying to hide the evidence with towels and water before finally calling me in a panic. When I opened the bathroom door, I was greeted by a shower scene straight out of Psycho! There was so much blood all over his body, all over the shower, and all over a wash cloth and bath towel that my mind struggled to comprehend what I was seeing. I tried to stay calm and figure out where the blood was coming from... not easy to do when the shower is still going and making the blood run! After checking that all his teeth were still in place, he finally admitted what he'd done. I calmly asked him what we learned in Cub Scouts about first aid for a bleeding wound, and he knew that we needed to apply pressure. I sacrificed another washcloth to the cause. After 30 minutes, the blood stopped and I put on some prescription antibiotic ointment and a bandage and sent him to bed. And before you think that Michael is so lucky to have missed all this drama, please know that Nathan and I were actually talking to him on Skype when it happened! So he heard the yelling and the shrieking and I'm sure it wasn't easy on him to be so far away as the drama unfolded just off screen, while the ever-dramatic Nathan gave Mike the play-by-play! It's so true, these kids are growing up way too fast. There's nothing I can do to stop it. The best I can do is to just grow up, right along side them. I'm so busy and stressed and feel like I'm missing so much. I'm so grateful to have a spot like this to put it all down, best I can. Because I know that when they are 16 and 14 I'll come back and read this and probably laugh my head off over being concerned about girls "liking" Nat and Ben trying to shave. But this is where I am today. And I'm simply not ready to grow up any faster than I have to! Now if only I could teach my boys the same thing.